Where have I been? What have I been doing? None of that matters really, what does matter is that it's time to resurrect this blog! I've been thinking about it for months but the drive hasn't been there.. It's that little push that comes from within that makes us follow our passions, dreams and hobbies. A lot of the time I hear that voice that says "no one will read this" or "your opinions aren't important" but after ignoring those thoughts I get another which says "do what makes you happy, do it because you enjoy it". So I will, because sometimes you need to create your own happiness when life isn't naturally delivering it to you. So what is involved in the process of resurrecting a blog? Well first there is the drive that I spoke of earlier but there is also a need for passion of the blog topic. The passion for cosmetics and skincare never went away and has in fact been keeping me busy these last few months and finally tonight I got that little inner push to pick up my iPad, dust off the cobwebs and get back in the game. Next you have to remember your google account password.. Here I had a derpette moment, as I often do but instead of wracking my brain in frustration I quickly reset it, cheers google for making that easy! And finally, the resurrection post. I considered typing up a long winded post about where I had been and what I'd been doing but to be perfectly honest, I can't be stuffed. I just want to pick up where I left off, so that's what I'm doing. To celebrate the resurrection of my blog I'm going to be giving away a full size Benefit It's Potent! 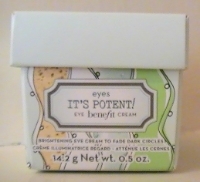 eye cream. Entry is open to Australian residents only (sorry international readers, first giveaway so taking baby steps). Entries open on 10th of June 2013 and close midnight on 24th June 2013. Winner will be contacted via Email and have 48 hours to respond before a new winner will be selected. I wish I could resurrect my 18 year old self. Great to see that you are doing what you love. Thanks for holding such an awesome giveaway. It is very generous of you! I would like to resurrect... hhhmmm, the healthy me. Being in pain everyday gets pretty old. Great to see you back and blogging! Can't wait to read more of your blogs. I would like to resurrect my fitness, I always say I have no time but it's just an excuse hehe. I want to resurrect my make-up stash! All my loved products are getting old and I am so so lazy with replacing everything!